This year as the new gardening season kicks off I am using, for the first time, some seeds that I saved myself! Seed saving starts with your initial seed choice, so believe it or not early spring is a great time to talk about how to save your own seeds. 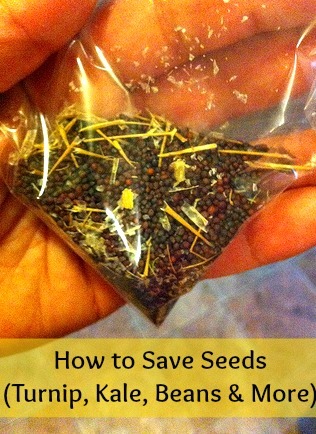 In it’s essence seed saving is pretty easy–you let a plant complete it’s life cycle, set seed and then collect it. In practice there are a few details that must be attended to if you actually want your collected seeds to produce the plant you expect. Saving seeds starts with the seed choice of your initial cultivar (aka the type of pepper, the type of lettuce). You need to start with a seed/plant that is either listed as being “Open Pollinated” or “Heirloom”. Open Pollinated means that it breeds true–the seed grower saves seed just like you want to by letting the plant go through it’s life cycle and then saving the seed. Regardless of a person’s specific interpretation, most authorities agree that heirlooms, by definition, must be open-pollinated. Hybrid: There is a lot of confusion about hybrids. A hybrid simply means that you cross 2 different parents to get a child plant with specific characteristics–but that child probably won’t breed true. 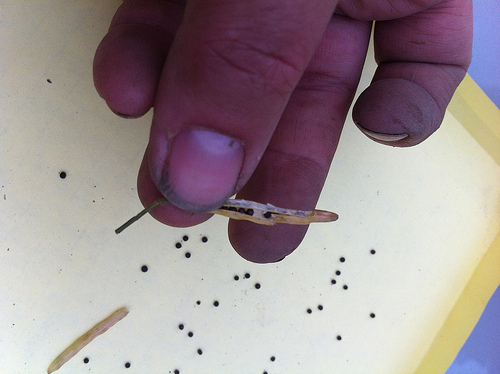 You do not want to practice seed saving on a hybrid. Let me use a dog example to make this clearer. A Labradoodle is the cross between a Labrador and a poodle. When you breed those two dogs together you get a dog with a pretty regular set of characteristics that we call a Labradoodle. However, if you breed two Labradoodles together you are not necessarily going to get a Labradoodle-you may get something that is more poodle or more Labrador depending on which way the genetic dice roll. Now if you took the puppies that were most like the initial Labradoodle and bred them, and kept doing that process over and over until you got dogs where every time they had puppies you had a labradoodle, then you’d have a new breed. So a hybrid is sort of the first step to a new variety-except that it’s just easier to keep producing the hybrid than to go through the process of developing a new variety (or maybe for some reason they can’t get it to come up stable). Why buy a hybrid over an heirloom? Well it may have specific characteristics you are looking for, like disease resistance. Since hybrids will not reproduce the same plant, you really don’t want to save seed from them. The exceptions would be if you had no choice (ie you can’t buy the seeds any more and are willing to risk it), if you are interested in breeding your own strain from it (which can be done-that’s beyond the scope of this article) OR if you are interested in growing seed just to use for sprouting (at the sprout stage the difference should be negligible). Please remember–Organic seeds can be hybrids! 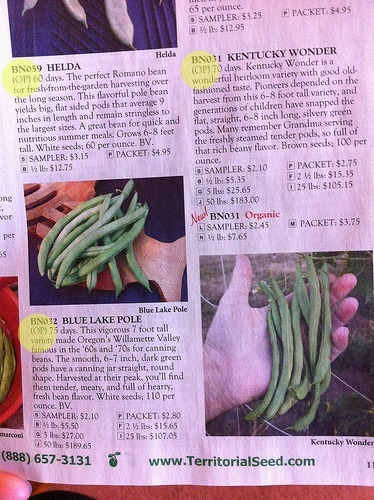 So how do you know if a seed is Open Pollinated (OP) or Heirloom? 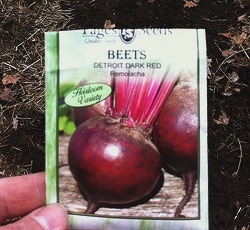 Well if it’s Heirloom it will usually say it on the package (just like in the picture of beet seeds above). Some seed companies will specifically state if seeds are OP or hybrid (I notice that seed catalogs are much better about doing this in their listings rather then seeds you find at the store). If it says “F-1” anywhere in the name or description, that’s definitely a hybrid–otherwise you might just have to call the company and ask. 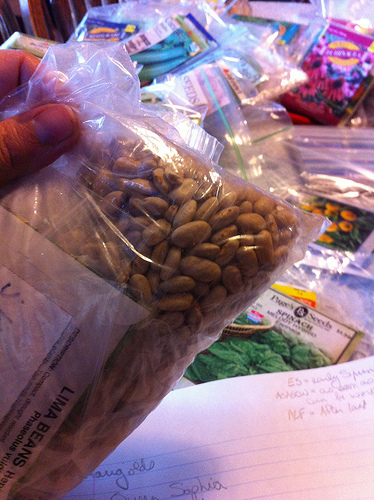 The second issue you have to be careful of when saving seeds is cross pollination. Basically you can accidentally create your own hybrid in your garden–except unlike hybrids that are intentionally bred, yours might not have any particularly positive characteristics! In order for plants to cross pollinate they have to both be compatible and be flowering at the same time. The fruit of the plants will be true to type, but if you save those seeds the NEXT generation will be a hybrid caused by the cross pollination. The easiest way to prevent cross pollination is to only plant a single cultivar–if the only kind of squash you’ve got growing is zucchini, you don’t have to worry about them crossing with anything else! If you’ve got zucchini and crookneck yellow squash, which WILL wind up flowering at the same time, well your next generation is going to be something that is neither. You can keep a seed prone to cross pollination pure by “isolating” the crop if you are planting more than one variety. You do this by making sure the two crops are planted far enough apart. If you google “cross pollination distance” or “isolation distance” and the name of the plant you’ll be able to pull up some data. Fedco has a seed saving chart on their website that includes isolation distances. For example it lists that lettuce types should be 50 ft apart to prevent crossing, but that corn should be a half mile apart. There are some tricks you can use to get pure seed without adhering to the isolation distances–basically you catch the plant right as the flower opens, hand pollinate it and then cover that flower so that nothing else can pollinate it (either by bagging plants, netting it, taping the flower shut with painters tape etc) You then have to mark that fruit so that you know as it grows that it is the good fruit/flower/whatever to save from. Finally some plants are self fertile and very rarely cross pollinate–for example beans. That makes saving seed very easy! You just don’t have to worry at all. Very, very long story short–do a quick bit of research on the type of seed you want to save and see what your options are. Now, on to the actual seed saving! Today I’m going to show you how to save seeds from plants that actually set seed (rather than ones where the seed is embedded within the fruit–that’s a different process). 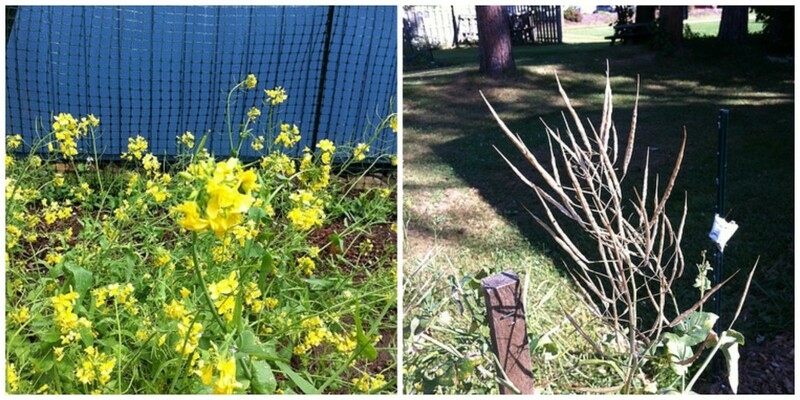 Last year I planted a single type of turnip and a single type of kale–neither of which was blooming at the same time. None of my immediate neighbors had a vegetable garden at all, so I wasn’t concerned about cross pollination. Then I simply collected the pods into a paper bag, crunched them a bit to pop open the seed pods, pulled out the chaff and viola! Seeds! With some of the pod producing plants you might have to manually break open the pods and remove the seeds. Beans are even easier. Just leave them on the vines/bush until they are dry enough that the beans rattle inside the pods. Shell and store. As for storing the seeds once you have them, cool, dark and dry are the best things for them. I like to save up all those little silica gel desiccant packets you get in pill bottles or boxes of new electronics. You can also order them new online if you like. Then I just toss the seeds in a baggie with the desiccant and store them in our basement fridge which is cool and dry, and since it isn’t open much pretty dark (although honestly I’m not sure how big a deal dark is). Oh, and one last point. Make sure you label your seeds! Trust me, all those little black seeds or little gray seeds, or brown beans start looking alike, especially after they’ve been in storage a few months. Good post. The desiccant is a good idea. I’ll try that this fall. I saved some pea, lettuce, and cilantro seeds from last fall so this is the first year I will be planting from saved seeds. This fall I plan to gather more types. 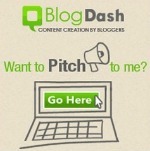 Very interesting and informative post. Did not know much about this topic but I really learned a lot here. Thanks for your insights. So glad! I try to make my posts as informative as possible. I know that I personally really like to know all the details when I’m trying a new skill such as seed saving–so I always try to share all that kind of detail with my readers. Thank you for pointing out how important it is for saving seeds.